It was during his tenure at the City Planning Commission that Bacon and his staff conceived and implemented numerous large- and small-scale design ideas that shaped today’s Philadelphia. These design concepts became Penn Center, Market East, Penn’s Landing, Society Hill, Independence Mall, and the Far Northeast. The Center City Commuter Connection, a seemingly radical idea at the time, was conceived during the 1950s by Planning Commission staff member, R. Damon Childs, who succeeded Bacon as Executive Director. Not all of the concepts that Bacon supported materialized. One proposal that he inherited from Robert Mitchell was to encircle Center City with a series of expressways, including the so-called “Crosstown Expressway” (I-695) and the Vine Street Expressway (I-676) linking the Schuylkill Expressway (I-76) with the Delaware Expressway (I-95) via South Street. Three of the four expressways were built; however, the Crosstown Expressway faced significant local opposition and was never built, while a scaled-down expressway was built at Vine Street. Both a nostalgic look at how we got here and a glimpse at a Philadelphia That Never Was, we recommend you set aside some time to take this film in and marvel at how far we’ve come over the decades. The basics: A renewed focus on innovation led to the development of the Jefferson Accelerator Zone at Thomas Jefferson University, a space to foster collaboration and the exchange of ideas among faculty and students from different departments on campus. Completed in January 2015 and designed by Cecil Baker + Partners, the new facility provides users with a unique gathering space and enlivens the block with its open and illuminated façade. The fast-track project required zoning approval for its unorthodox bay window and non-conforming signage. The glass and systems: Central to the design is a dramatic projecting glazed façade that replaces the traditional brick o n a narrow two-story rowhouse owned by the university. The architect worked closely with the structural engineer, general contractor and glazing subcontractor to produce the unusual façade. On the second story, the façade juts out to form a kite-like bay window that extends three feet over the sidewalk, the legal limit. Newman Glass, Camden, New Jersey, the glazier and fabricator, made the custom fabricated aluminum curtain wall with tube steel structural support from Independence Steel. Now that the “Nutter Era” is officially past tense, and Jim Kenney is managing this obstreperous city, we’ll be seeing a lot less of Michael Nutter, the person. Yet the architectural additions and deletions that occurred during his tenure will stay with us for a long time. What were its hallmarks? Sadly, this period yielded very little of the kind of architecture that ends up in the history books. That’s partly because Nutter took office as the United States was slipping into the Great Recession and developers’ best-laid plans were going awry. Lacking cash for major public undertakings, Nutter’s team became an early adopter of tactical urbanism, like pop-up beer gardens and painted bike lanes. One of his administration’s most lasting design legacies turned out to be its enthusiastic embrace of the temporary. At the other end of the spectrum was a trend so ubiquitous it practically flew under the radar: the rowhouse boom. Roughly 4,000 of these vertical single-family houses were erected during the Nutter years, catapulting unchanging redbrick neighborhoods into the 21st century. Every mayor is, deep down, a master builder. Many qualities that make a project memorable, like materials and formal details, are beyond the city’s control, but a mayor can set the tone, establish priorities, and, most crucially, use the respect for the office to twist arms. Nutter and his team did that with varying degrees of success. Here are my 15 candidates for the best and worst designs completed during his tenure. You can start disagreeing now. The new rowhouse. Packed with the kind of amenities once synonymous with a house in the suburbs, the teeny trinity has morphed into a McRowhouse – bigger, taller, wider, grander, and more expensive. The new designs allow people to live in the city without giving up the domestic comforts that Americans prize. Unfortunately, too many come with front-loaded garages. They can also upset local economic and class dynamics. Singh Center for Nanotechnology. This sublime glass outcrop at 33d and Walnut by Weiss Manfredi is as much a piece of man-made topography as it is a building. The University of Pennsylvania building is also the only Philadelphia design during Nutter’s tenure to make the cover of Architectural Record. The Barnes Foundation. Despite being crammed onto a site that is too small for its purpose, and that devotes too much space to the car, the museum on the Parkway by Tod Williams and Billie Tsien is itself a great, sensuous work of art. The architects pulled off the impossible trick of replicating the Barnes’ Merion galleries without making them feel embalmed. Antoinette Westphal College of Media Arts & Design. MS&R’s Jefferey Scherer and Garth Rockcastle took the 1978 “decorated shed” created by Robert Venturi and Denise Scott Brown and blew out the interior, turning an open-plan office space into a mind-blowing, Escher-inspired puzzle. 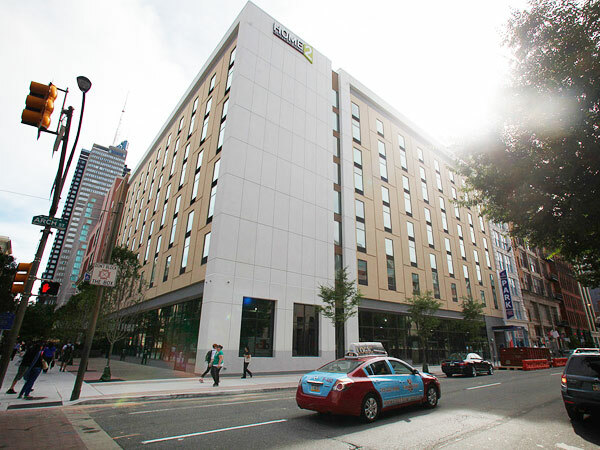 Just walking into the Drexel University building at 35th and Market will make you more creative. Affordable housing. Two projects, Paseo Verde at Ninth and Berks and the John C. Anderson Apartments on 13th Street, offer proof that low-income housing can slip easily into the urban fabric, and look good doing so. Transit-friendly Paseo Verde includes 67 market-rate units and ground-floor retail, and Anderson caters to LGBT seniors. Neither would exist without Nutter administration support. Both are the work of WRT. Cheesecake Factory building. Who would have expected a three-story commercial building to make our hearts race? BCJ’s cutaway at 15th and Walnut challenges the modernist idea that glass walls are curtains that lightly enclose space. Instead, you perceive this building as having thickness. Although Nutter is fairly criticized for his expedient treatment of Philadelphia’s historic patrimony, he deserves applause for some big rescues: Willis Hale’s long-suffering Divine Lorraine on North Broad and a pair of Germantown white elephants, the Nugent and Presser Homes. Sensitively renovated by JKR Partners, both house low-income seniors. Pine and Spruce bike lanes. There were bike lanes before, but these wide, buffered crosstown versions helped legitimize bicycles as transport. Niche parks. The Nutter era was a golden age for park building, especially parks that cater to specific users. 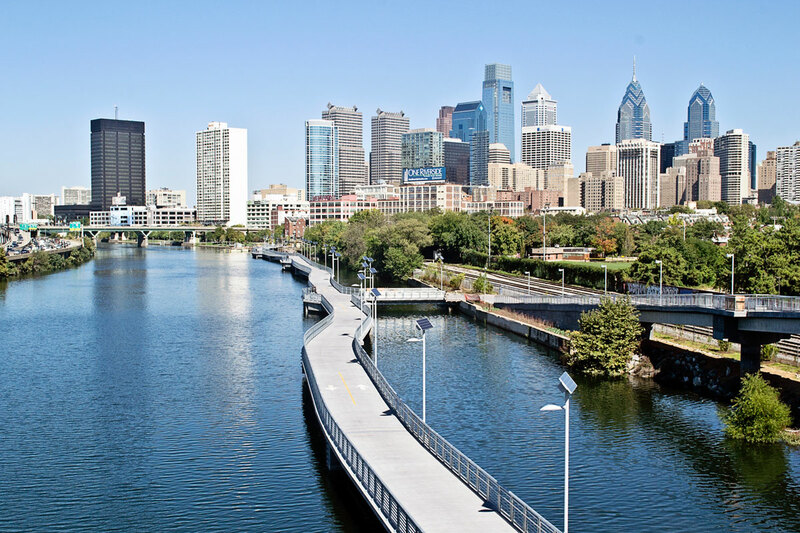 Sisters Cities serves the preschool set, Paine’s Park provides a lush oasis for skateboarders, and the Schuylkill Banks Boardwalk lets trail users walk on water. And now the bad . . .
1900 Arch apartments. This building wasn’t designed, it was canned. Light-repelling metal panels span the surface, mimicking a retail bar code in a depressing gray-blue color scheme. For some reason, a large patch of the 19th Street facade has no windows. How can such a dreary building rub elbows with Norman Foster’s elegant Comcast tower? Blame Varenhorst architects and developer PMC. Home2Suites. This is what happens when a highway motel chain dumps its standard formula into the big city. Slathered with sickly yellow, synthetic stucco – another architectural scourge – it looks like a plastic box next to the mighty stone Reading Terminal Market. Given that public subsidies covered nearly half the $59 million cost, we were badly overcharged. Family Court. Bad enough that the Pennsylvania Supreme Court outsourced a temple of justice to a second-rate office developer and well-connected lawyer, but did the EwingCole design at 15th and Arch have to be a variation of the boxy Penn Center buildings? With the lights on at night, it looks as though someone forgot to finish the interior walls. SugarHouse Casino. Tell me again why we sacrificed a beautiful stretch of the Delaware River for a big, windowless box and an even bigger garage? Let us always remember that the dazzling, historically protected Boyd Theater was lost on Nutter’s watch, in a bait-and-switch developer deal. During his tenure, churches fell with depressing regularity, including ones designed by noted architects like Samuel Sloan and John Notman. North Broad light poles. The city spent $14 million on a North Broad Street makeover and all we got was a phalanx of metal poles. The money would be better spent fixing sidewalks and making the street safer for pedestrians. Mayoral Candidate Jim Kenney recently answered industry questions ranging from restructuring L&I to overwhelming regulations on city contracts. Please see excerpts below. For more information, contact Stephanie Staub, Marketing Director at 215-825-1422. John Dougherty, leader of the politically powerful Electricians union in Philadelphia, expanded his sphere of influence Wednesday with a new title. Dougherty was selected to succeed Pat Gillespie as head of the Philadelphia Building and Construction Trades Council, which represents nearly 40 unions in Philadelphia and the suburbs. Gillespie, who has served as business manager for the union coalition for 34 years, said he had wanted to retire by Nov. 23, his 70th birthday.